Compact HTML editor with instant previewer for create website easily! » delivers a lightning fast environment, instant preview, powerful set of tools! » Single .EXE file - 900KB full download, and takes less than 1.8MB for full installation ! » Portable. Carry it anywhere -- run directly from USB Drive, Memory Stick without installation. » Can run on Windows 95/98/XP/2000. If your computer can run NOTEPAD, it can run DiDaPro just as fast! » Used since 1996 by many schools, universities, classes to teach HTML! » Download FREE Trial version -- register full version for only $29.95! 5 COWS Rating on TUCOWS! make your own website, website builder, create your own website in few clicks its really fast and realiable. Set page's background, text, and link attributes in one screen with instant preview. Easy Table editor with spreadsheet style interface and instant previewer. Large file size support - no more 32KB file size limit! Easy FORM editor with instant previewer. Powerful, flexible User Tags Support. Right Mouse Button access to all functions. Auto line selection, Auto tag removal. File History, Current Line Number. Application launch bar for easy launching of application from DiDa. You can register DiDaPro online with credit card, or by using our TOLL Free number. Royalty-free version available for unlimited distribution. 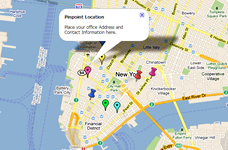 A simple mapping software to make your own Google Maps for adding to your own website. Use this online Google Map builder to create personalized, annotated, customized maps for businesses, parks, schools, real estate and more. Only One solution, use our fast website builder to create your own website within few clicks.